Friends, I think Method hand wash is the gateway product to total Method fandom. It starts with trying Method soap at a friend’s house. Perhaps you notice it because it matches your friend’s bathroom (the brilliant colors really are divine) but instead of the cloying smell of most soaps, you get a whiff of something…something wonderful. Whether it be green tea + aloe or mandarin mango, your nose is in for a subtle treat that will last long after you leave the bathroom. I really think Method’s beautiful fragrance options turns the mundane task of washing one’s hands into a little pick me up in the middle of the day. And ah, those beautiful teardrop shapes—graceful, hip and perfect in any space. You can even try the “fun foam” which I think would be a big hit with the kiddos. The Method designers really outdid themselves with these very subtle, but very Disney soap dispensers that have turned both the Peach and Alix’s Wolfie into little hand-washing heroes. And that foaming soap really packs a punch, cleaning my little mud-pie-making girl’s hand clean as a whistle. In fact, the Peach loves her Method Minnie Mouse soap so much, she actually took it in as her Show-and-Tell item to pre-school! Mickey smells like lemonade and Minnie smells like strawberries. The scents are delicately yummy—not overly sweet. I think even grownups will love them. 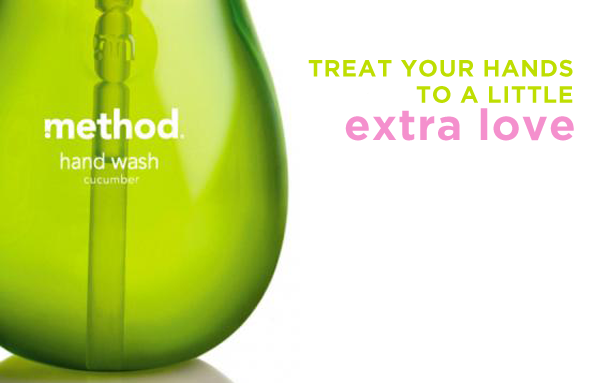 In addition to keeping our kiddos clean, we also like them to be healthy—and fortunately Method feels the same way. Word on the street is that triclosan, a popular ingredient in many hand soaps (particularly antibacterial hand washes) isn’t so dandy for you. Even the New York Times isn’t too hot on it. Method considers triclosan to be a “dirty ingredient” and never uses it in any of their products. Did you know triclosan is not only unnecessary, it’s a potentially harmful chemical? Yeech. But back to our fabulous rainbow of fun. We can’t say enough about these lovely soaps—sassy scents, beautiful packaging, and as good for the environment as they are for you! And of course, they come in a rainbow of colors to make any design loving person tremble with delight. Just like the “guess-how-many-marbles-are-in-the-jar” contests – this month Method is asking fans to guess how many bottles of Method hand soap it took to build the spectacular rainbow light installation in this month’s video. The brainiac with the closest guess will win a $100 gift card to soap.com to stock up on method goodies AND, their very own rainbow of handwash (a set of 7 colorful method hand soaps). Not too shabby, eh? Nine runner ups will win a $50 gift card. Fans can guess daily for more chances to win. Do you use Method hand soap? What is your favorite fragrance? but all opinions are, of course, always our own. To read more on Method’s green practices, ingredients and philosophy, go here. the french lavender is one of my faves too….just smells so fresh and CLEAN! i have to get the Method Mickey and Minnie Mouse soap for my piano students!!! Hope its available around here in Michigan. click that link in the post (where it says Mickey and Minnie!) and you can order it off Amazon! Trust me, they’ll love it! That little soap has made all the difference in the Peach’s hand washing attitude! I even bought the Method refill to keep it going after we used all of the soap up! Method works, I know, but the video really needs some soul to help make it real! I have not yet tried any of the fragrances but sure sounds like something I have to do. I have not yet tried any of the fragances but sure seems like something I must do quickly.